viola grace (in lower case letters, for some reason) is a rare duo-almost-multi-chrome, it turns blue to purple in seconds, depending on the angle that you look at it. At a really extreme angle there is a gorgeous pink flash that I couldn't capture in these pictures. I've been wanting to try this brand for a while now and it completely fulfilled my expectations. Thank you to my friend Tepp who brought me this from Japan. 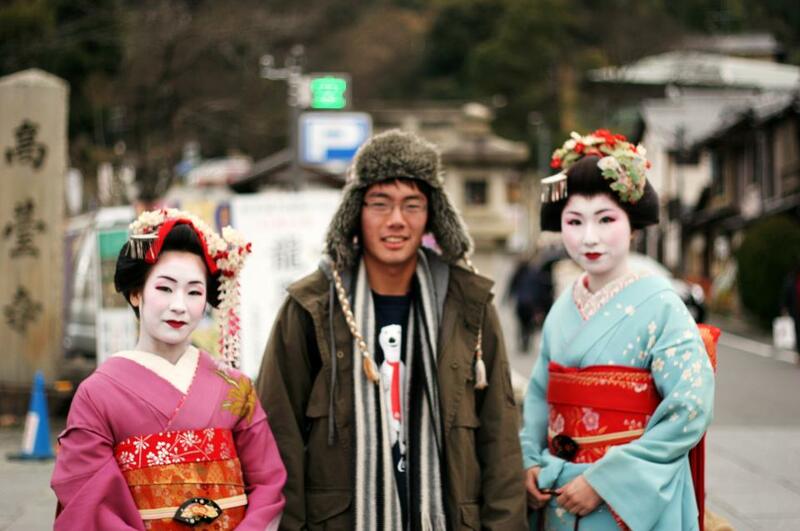 BONUS PICTURE - My friend (middle) on his trip, next to authentic Geishas! thanks! The color is so intense, it glows. I've never heard of that brand, is it Canadian? to me, it reminded me of Brucci Typhoon Lagoon. Thank you! 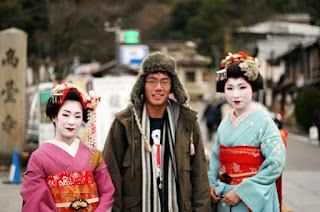 It's so pretty it makes me want to go to Japan ASAP! This is absolutely breathtaking! Amazing that it's only 2 coats. Yeah but 2 coats over another purple, by itself it would probably be 4, I don't want to waste eet! I desire this greatly.. where did you buy it? A friend of mine brought it from Japan, they have the best nail polishes there!